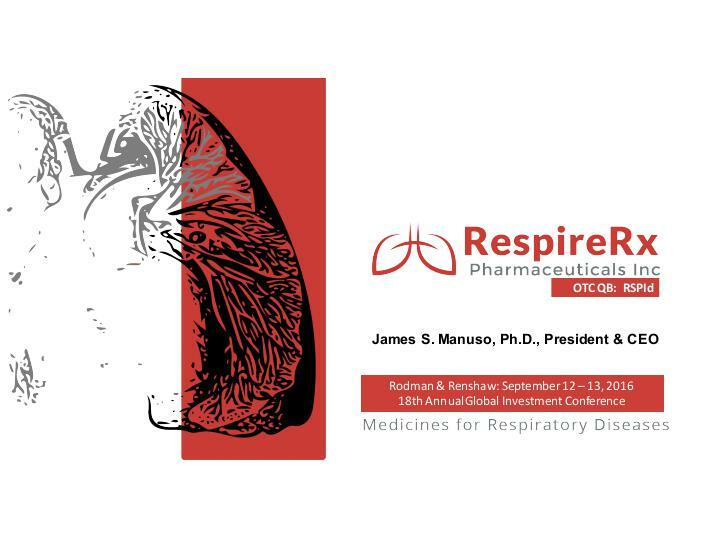 On September 8, 2016, RespireRx Pharmaceuticals Inc. (the “Company”) announced that the Company’s President and Chief Executive Officer, James S. Manuso, Ph.D., will be presenting at the Rodman & Renshaw 18th Annual Global Investment Conference at the Lotte New York Palace Hotel in New York, New York. Dr. Manuso is currently scheduled to present at 4:15 p.m. Eastern Time on Monday, September 12, 2016. Dr. Manuso will present the Company's top-line data from its Phase 2A clinical trial of its proprietary orally administered ampakine, CX1739, conducted at the Duke University School of Medicine, which was determined to be safe and well tolerated and antagonized the respiratory depressive effects of remifentanil, a potent opioid. 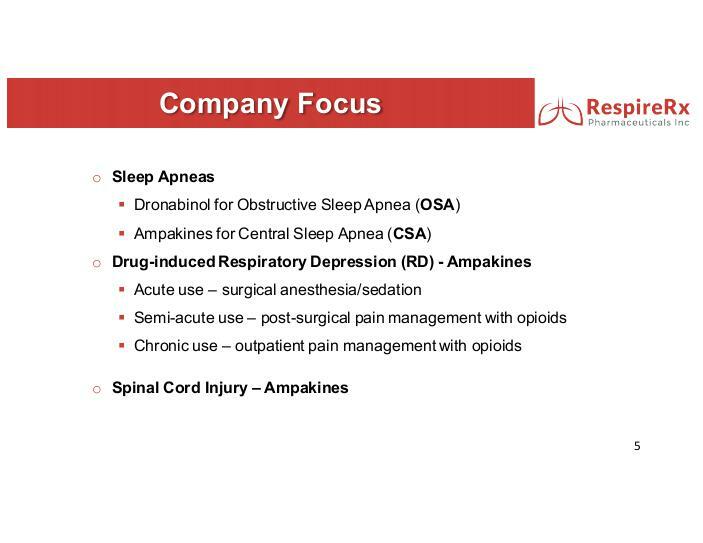 Dr. Manuso will also present the Company’s upcoming clinical initiatives with ampakines for central sleep apnea (Phase 2B) and spinal cord injury. Dr. Manuso will provide an update on dronabinol for obstructive sleep apnea (Phase 2B). The slide presentation that the Company will be using at the conference is attached as Exhibit 99.1 and is being furnished and not filed pursuant to Item 7.01 of Form 8-K. The presentation will be available by live webcast that can be accessed http://wsw.com/webcast/rrshq26/rspi. The presentation and slides will be accessible after the presentation by clicking on the investors tab on the RespireRx web-site at www.respirerx.com and following the links and instructions. The press release announcing the Company’s participation in the conference is attached as Exhibit 99.2. 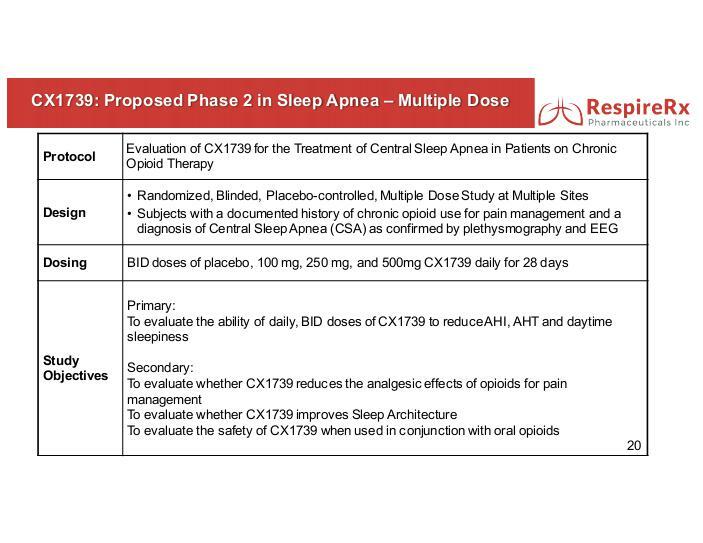 A subsequent press release, dated September 12, 2016, announcing preliminary, top-line results of the Company’s recently concluded Phase 2A clinical trial testing the impact of CX1739 on opioid-induced respiratory depression, is also attached as Exhibit 99.3. 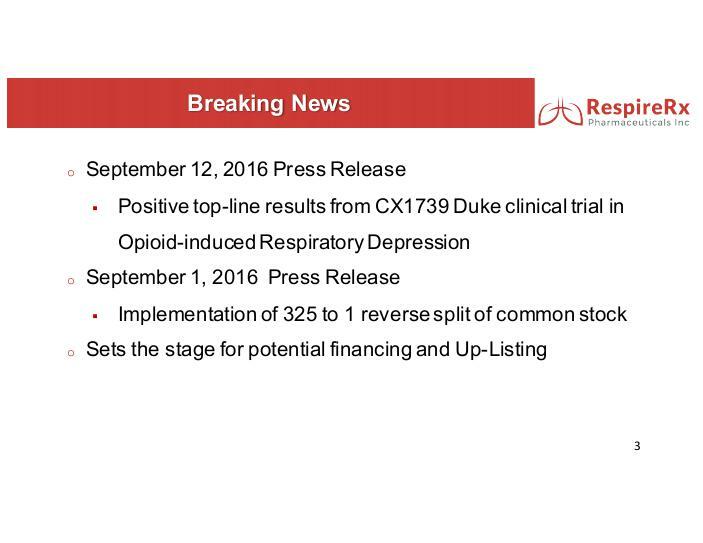 Glen Rock, N.J., September 8, 2016/Globe Newswire – RespireRx Pharmaceuticals Inc. (OTC QB: RSPI) (“RespireRx” or the “Company”), a leader in the development of medicines for respiratory disorders, including drug-induced respiratory depression and sleep apneas, announced that the Company’s President, CEO and Vice Chairman of the Board of Directors, James S. Manuso, Ph.D., will present at the Rodman & Renshaw 18th Annual Global Investment Conference (www.rodmanandrenshaw.com) at the Lotte New York Palace Hotel in New York, New York on Monday, September 12, 2016 at 4:15 PM ET. The Conference is sponsored by H.C. Wainwright & Co., LLC and is being held on September 12 and 13, 2016. Dr. Manuso will be available for one-on-one meetings with Conference attendees on both days. Dr. Manuso’s live presentation and accompanying slides will be accessible on Monday, September 12, 2016 at 4:15 PM ET using the following link: http://wsw.com/webcast/rrshq26/rspi. 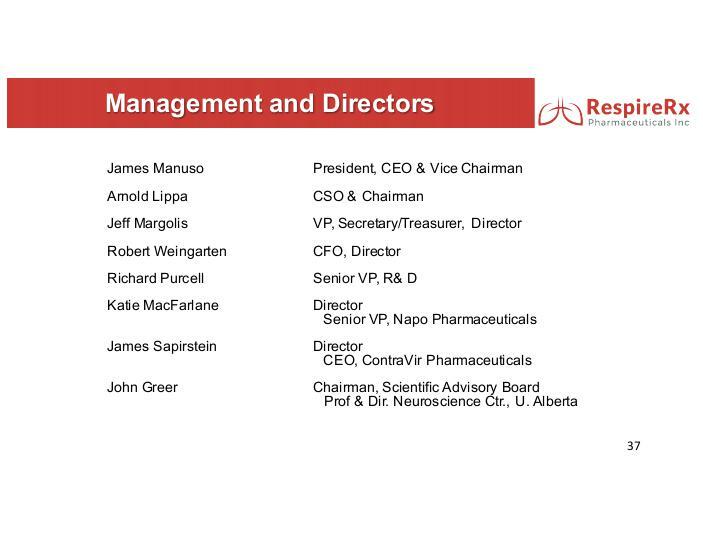 The presentation and slides will be accessible after the presentation by clicking on the investors tab on the RespireRx web-site at www.respirerx.com and following the links and instructions. A copy of the slide presentation being presented at the Conference will be submitted in a Form 8-K filing with the U.S. Securities and Exchange Commission prior to the presentation. 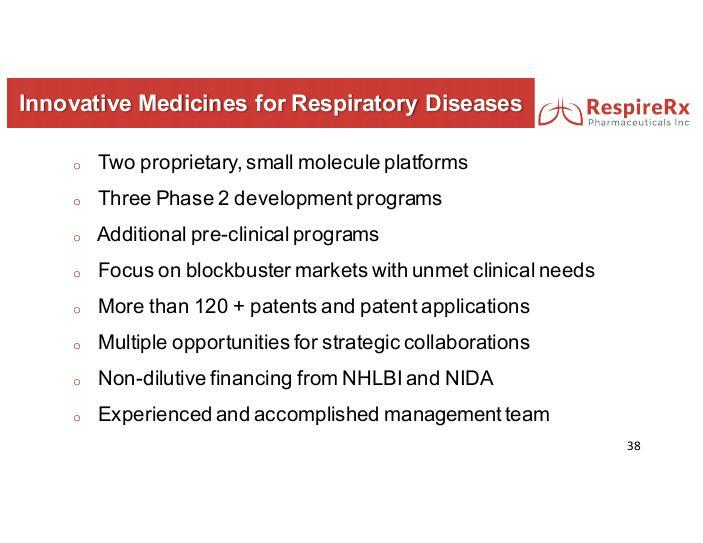 RespireRx has a pipeline of medicines in Phase 2 clinical development focused on pharmaceutical treatments for a variety of different breathing disorders. 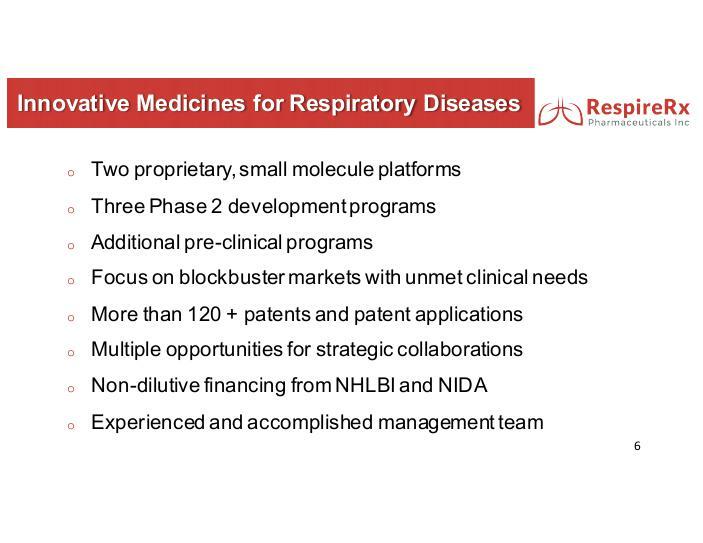 Clinical development in the area of respiratory disorders, particularly drug-induced respiratory depression and sleep apnea, has created opportunities for the development and commercialization of the Company’s compounds. Ampakines. 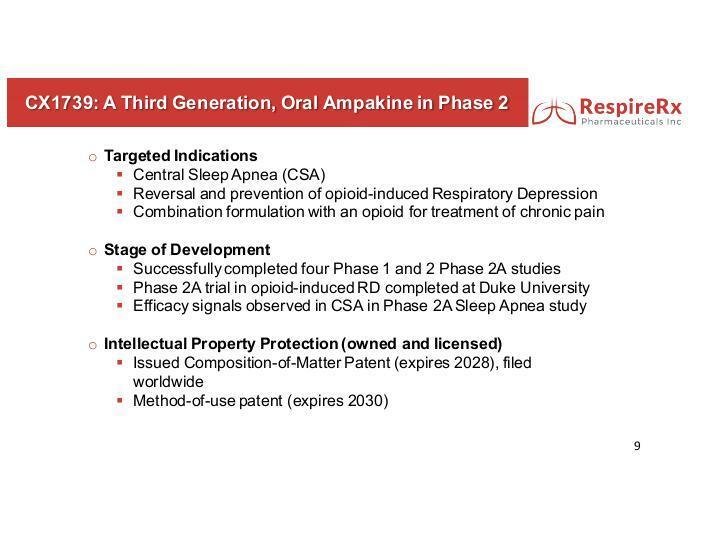 One platform of proprietary medicines being developed by RespireRx is a class of ampakines, which act to enhance the actions of the excitatory neurotransmitter glutamate at AMPA glutamate receptors. Several ampakines, in both oral and injectable forms, are being developed by the Company for the treatment of a variety of breathing disorders. 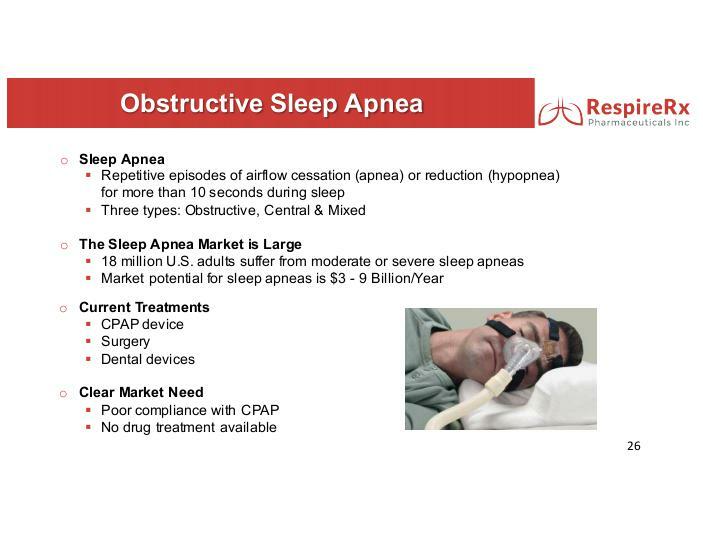 In clinical studies, select ampakines have shown preliminary efficacy in central sleep apnea and in the control of respiratory depression produced by opioids, without altering the opioid analgesic effects. In animal models of orphan disorders, such as Pompe Disease, spinal cord injury and perinatal respiratory distress, it has been demonstrated that certain ampakines improve breathing function. The Company’s compounds belong to a new class that does not display the undesirable side effects previously reported for other ampakines. During March 2016, a Phase 2A clinical trial at Duke University School of Medicine was initiated with the Company’s proprietary ampakine, CX1739, to determine the ability of its orally administered form to prevent the respiratory depression produced by remifentanil, a potent opioid, without altering remifentanil’s analgesic properties. The dosing portion of the clinical trial was completed in June 2016 and the clinical trial was formally completed on July 11, 2016. The Company is working with the Duke University clinical research team to finalize data analysis and issue a final report on the results of the clinical trial by the end of December 2016. Cannabinoids. 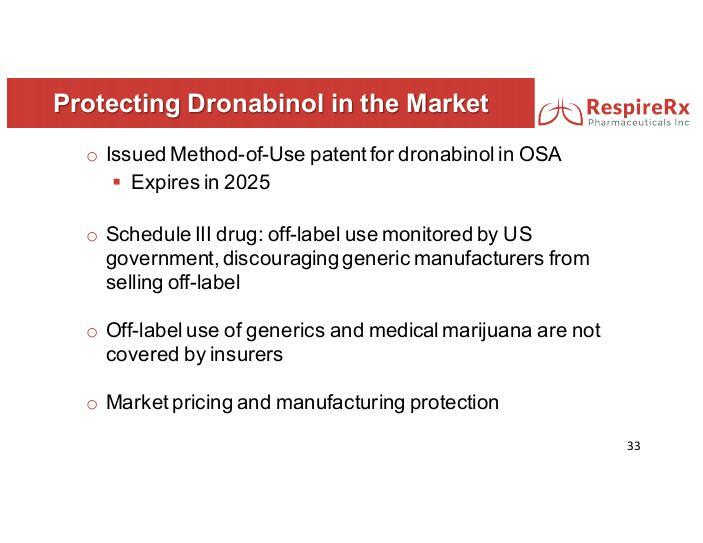 The other platform being developed by RespireRx is the class of compounds known as cannabinoids, including dronabinol. Under a license agreement with the University of Illinois, the Company has rights to patents claiming the use of cannabinoids for the treatment of sleep-related breathing disorders. 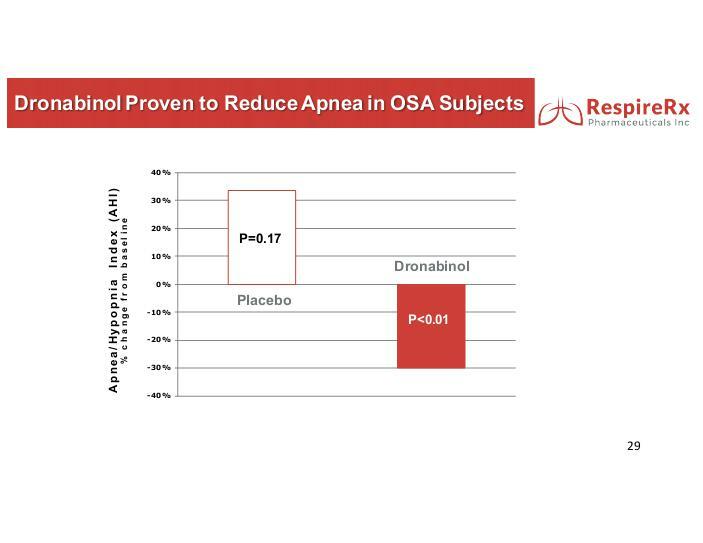 In a double-blind, placebo-controlled, dose-ascending Phase 2A clinical study conducted by the Company, dronabinol produced a statistically significant reduction in the Apnea-Hypopnea Index, the primary therapeutic end-point, and was observed to be safe and well-tolerated in a group of patients with Obstructive Sleep Apnea (“OSA”). 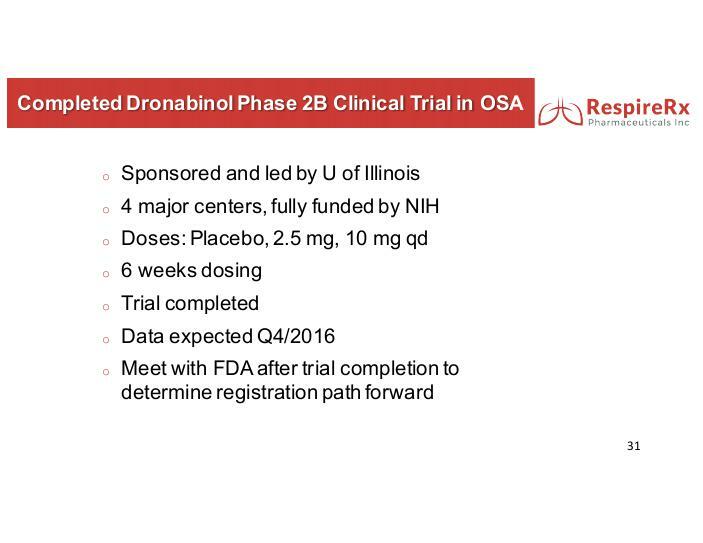 The University of Illinois and three other centers conducted a six week, double-blind, placebo-controlled Phase 2B clinical trial investigating the effects of dronabinol in patients with OSA. The University of Illinois has indicated that recruitment for this clinical trial was completed during the second quarter of 2016. Final research results are expected to be published in the fourth quarter of 2016. This clinical trial is fully funded by the National Heart, Lung and Blood Institute of the National Institutes of Health and is managed by University of Illinios researchers. This press release contains certain forward-looking statements within the meaning of Section 27A of the Securities Act of 1933 and Section 21E of the Securities Exchange Act of 1934 and we intend that such forward-looking statements be subject to the safe harbor created thereby. These might include statements regarding the Company’s financial position, business strategy and other plans and objectives for future operations, and assumptions and predictions about research and development efforts, including, but not limited to, preclinical and clinical research, deisgn, execution, timing, costs and results, future product demand, supply, manufacturing, costs, marketing and pricing factors are all forward-looking statements. Factors that could cause or contribute to such differences include, but are not limited to, regulatory policies or changes thereto, available cash, research and development results, competition from other similar businesses, and market and general economic factors. This press release should be read in conjunction with the condensed consolidated financial statements (unaudited) and notes thereto included in Item 1 of the Company’s most recently filed Quarterly Report on Form 10-Q and the Company’s Annual Report on Form 10-K for the fiscal year ended December 31, 2015, including the section entitled “Item 1A. Risk Factors.” The Company does not intend to update or revise any forward-looking statements to reflect new information, future events or otherwise. 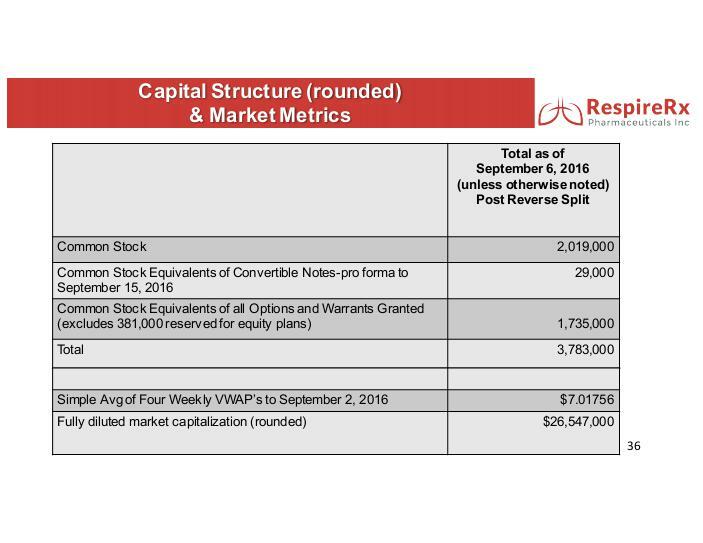 Glen Rock, N.J., September 12, 2016/Globe Newswire – RespireRx Pharmaceuticals Inc. (OTCQB: RSPI) (“RespireRx” or the “Company”) is a leader in the development of medicines for respiratory disorders, including drug-induced respiratory depression (RD) and sleep apneas. 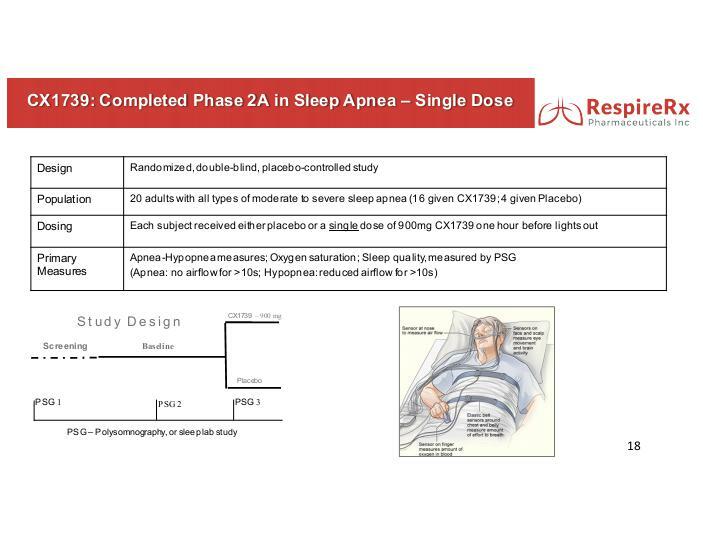 RespireRx is today reporting preliminary top-line data from its Phase 2A clinical trial of CX1739, the Company’s proprietary, orally administered ampakine. 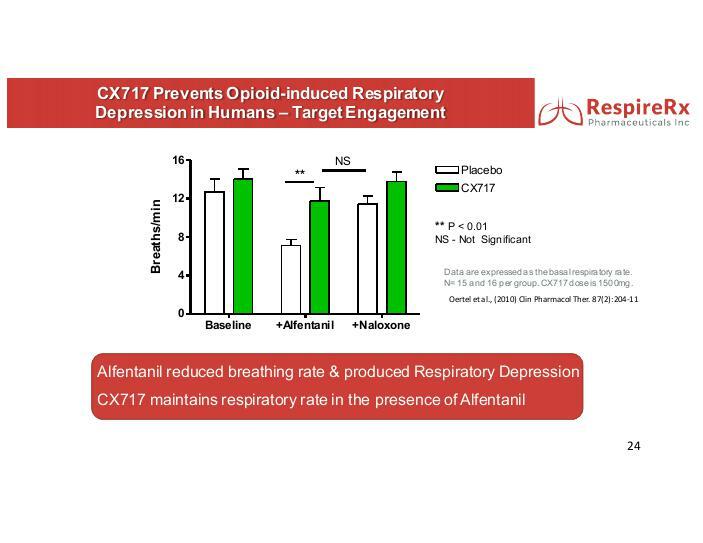 CX1739 was determined to be safe and well tolerated, and antagonized the respiratory depressive effects of remifentanil (REMI), a potent opioid, in clinical models of acute opioid overdose and chronic opioid use. 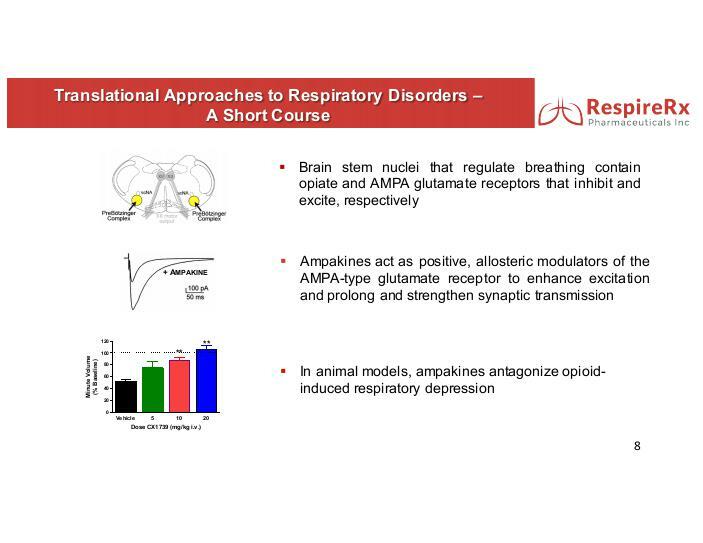 These results demonstrate target engagement of AMPA glutamate receptors and confirm the Company’s translational approach to developing medicines for respiratory disorders. The Duke University School of Medicine initiated this Company-funded Phase 2A clinical trial in March 2016. 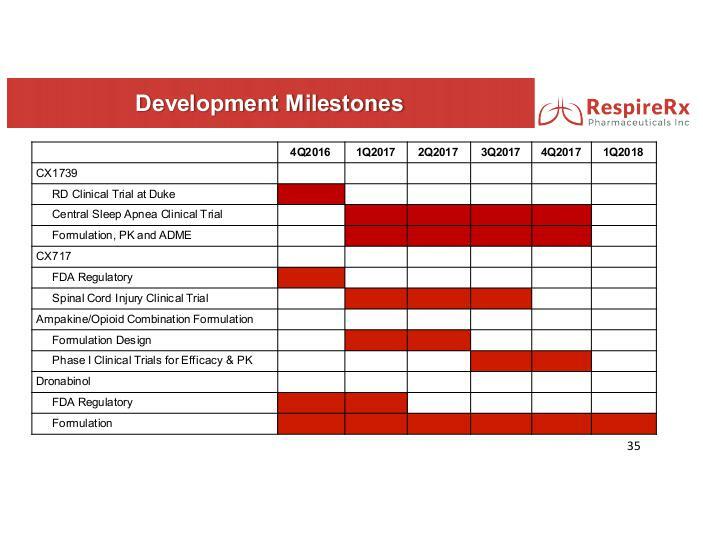 The dosing and data accumulation phase of the clinical trial was completed in June 2016 and the clinical trial was formally completed on July 11, 2016. Database unblinding occurred on September 7, 2016. 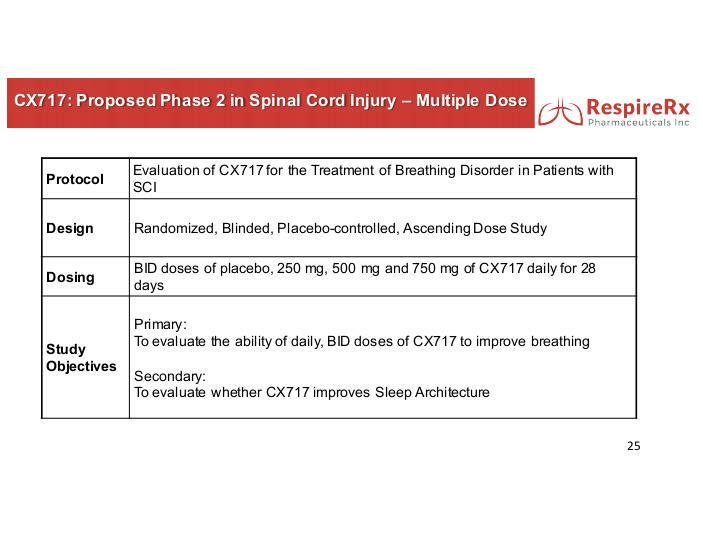 The clinical trial, conducted in two separate stages over a four week period, was designed to assess the safety of CX1739, as well as its ability to antagonize the respiratory depressive effect of REMI without altering its analgesic properties. Stage 1, a randomized, double-blind, crossover study comparing 300 mg of CX1739 to placebo, was considered a primary outcome study. After an overnight stay at the clinical facility, subjects were administered either placebo or CX1739. For the first visit, subjects were randomly administered either placebo or 300 mg CX1739. On the second visit, subjects were crossed over and administered the other compound. 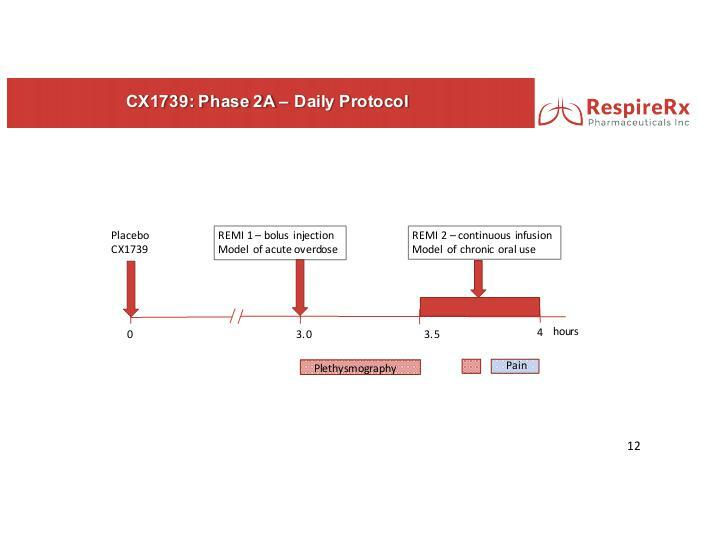 Three hours after receiving placebo or CX1739, subjects underwent a REMI 1 period in which respiration was measured by impedance plethysmography for 5 minutes, in order to establish a baseline. Subjects then received an intravenous bolus injection of REMI (1 ∝g/kg) and respiration was measured for an additional 20 minutes after the bolus injections). 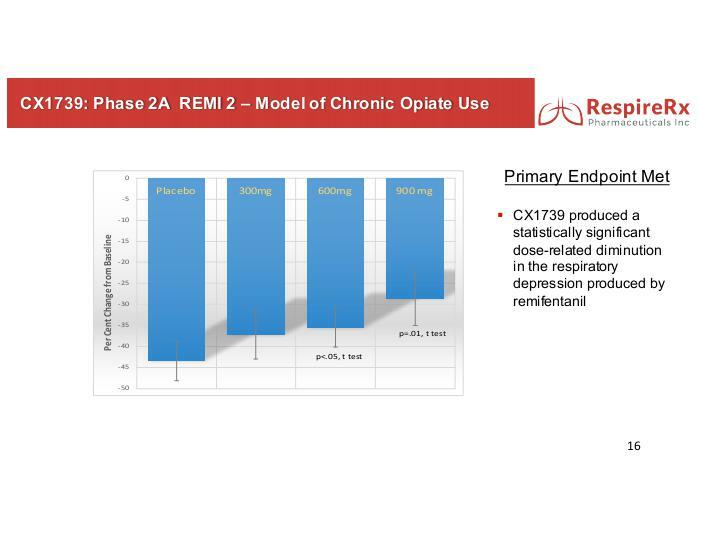 During REMI 1, the primary measure used to determine antagonism of respiratory depression was the calculated time to recover (recovery time – RT) from the maximal respiratory depressant effects (Emax) of REMI. Thirty minutes after the bolus injection of REMI, subjects underwent a REMI 2 period in which a continuous infusion protocol for REMI was begun (0.25 ∝g/kg bolus followed immediately by a constant infusion calculated to achieve blood levels of 2 ng/ml). After allowing 10 minutes for equilibration, respiratory rate, pain and pupilometry measurements were taken. 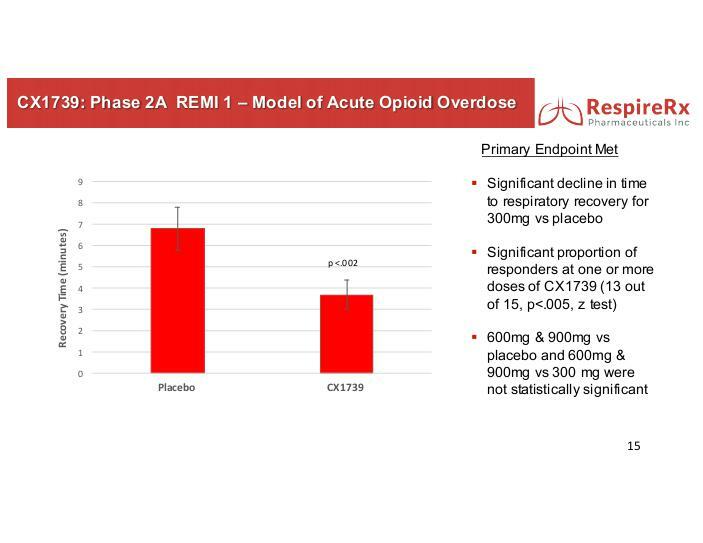 REMI 1 was designed as a model of acute opioid overdose, while REMI 2 was designed as a model of chronic, opioid consumption in which opioid blood levels remain relatively constant. 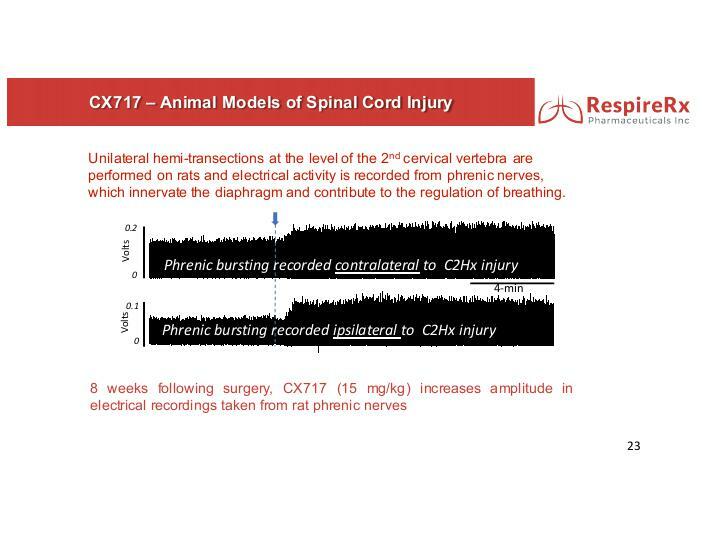 The clinical trial also evaluated the safety of CX1739 when taken alone and in conjunction with REMI and investigated the effect of CX1739 on the analgesic and sedative effects of REMI. These latter data have not yet been analyzed and will be reported at a future date. 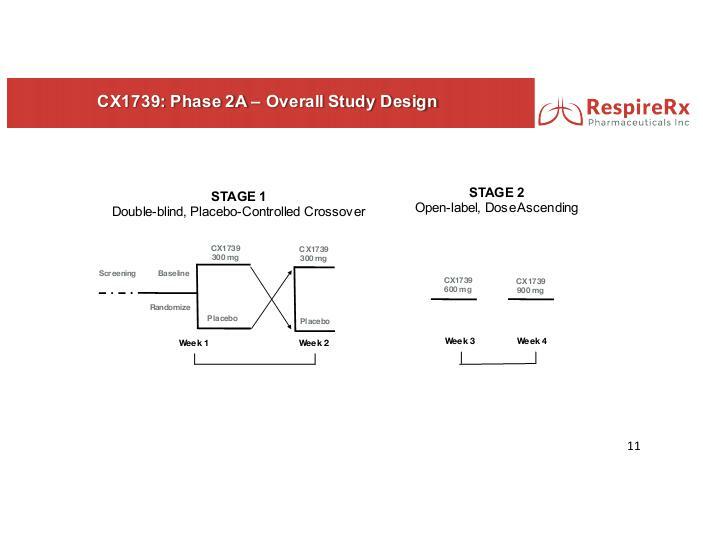 Stage 2 took place during the second two week period and was designed as an open-label, ascending dose study to assess the ability of 600 and 900 mg of CX1739 to antagonize the respiratory depressive effects of REMI. Otherwise, Stage 2 was conducted in the same manner as Stage 1. Twenty-one subjects initially were enrolled in the study and all were included in the safety analysis. Four subjects terminated early, two because of scheduling problems and two because of adverse events (AEs). Of the 17 subjects who completed the study, two did not display maximal depression of respiration rate (Emax) >25% and were not included in the respiratory data analyses. 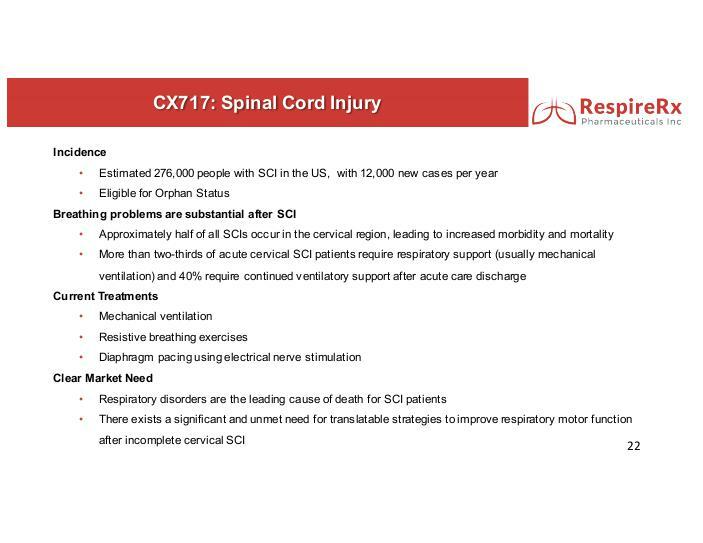 In general, CX1739 was safe and well tolerated, and no serious adverse events (SAEs) occurred. By far, the most frequent AEs were nausea, vomiting, headache and dizziness, all of which are common side effects of opioids. Forty-nine AEs were reported by 15 of the 21 subjects. Thirty-nine AEs occurred after the administration of REMI and 8 AEs occurred less than one hour after ampakine or placebo administration, a time period that is too early for significant blood levels of CX1739 to have occurred. REMI 1. 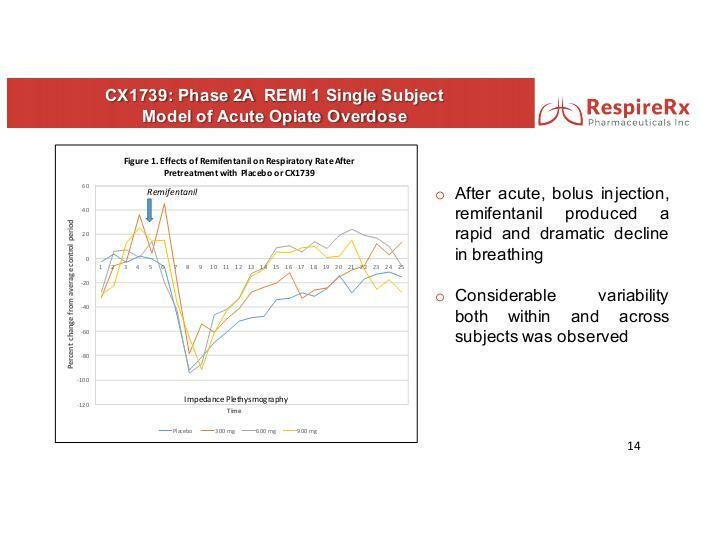 Acute bolus injection of REMI caused a rapid and dramatic decline in respiration, with Emax ranging from 15% - 100% across subjects. When subjects in Stage 1 were pre-treated with 300 mg of CX1739, a statistically significant reduction of RT, the primary outcome measure, was observed. RT was reduced from a mean of 6.8+ 0.98 after placebo pre-treatment to a mean of 4.4+0.77 after 300 mg of CX1739 pre-treatment (p=.01, paired t test). In Stage 2, RT was reduced for both doses, although no significant differences (p>.05) were observed when these doses were compared to either placebo or 300 mg. While this difference between 300 mg and the higher doses might reflect greater efficacy at the 300 mg dose, the Company believes that this lack of significance for the higher doses might also reflect inter-subject variability in what doses produced the optimum decline in RT. Supporting this idea, responder analysis revealed that decreases in RT were observed, in a statistically significant proportion of subjects (13 out of 15, p<.005, z test), after one or more doses of CX1739. Using these data from optimum doses, mean RT was significantly (p<.002, paired t test) reduced from 6.8 +0.98 minutes after placebo to 3.7 +0.70 minutes after CX1739. REMI 2. The REMI 2 period began 30 minutes after the REMI 1 bolus injection of REMI and in this case was a continuous intravenous infusion. Baseline respiration was recorded during the first 2 minutes. 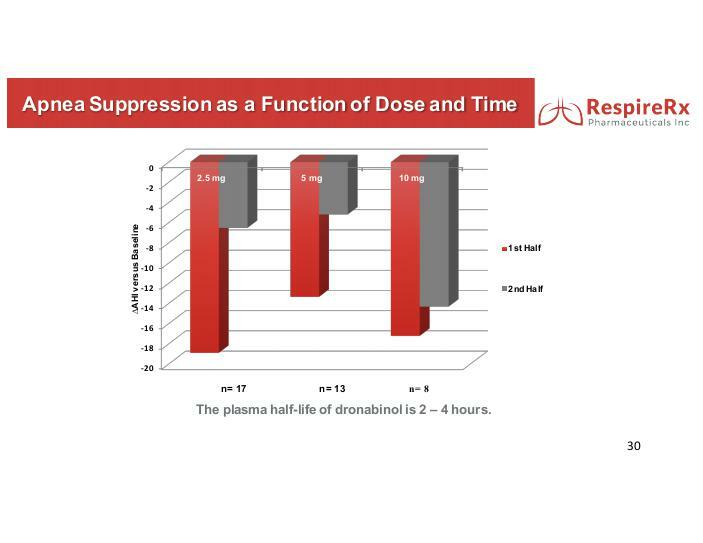 Ten minutes after REMI 2 began, when respiratory rates and presumably blood levels of REMI had stabilized, respiration was monitored continuously for 5 minutes and the average percentage change from baseline for the 5 minute interval was determined. 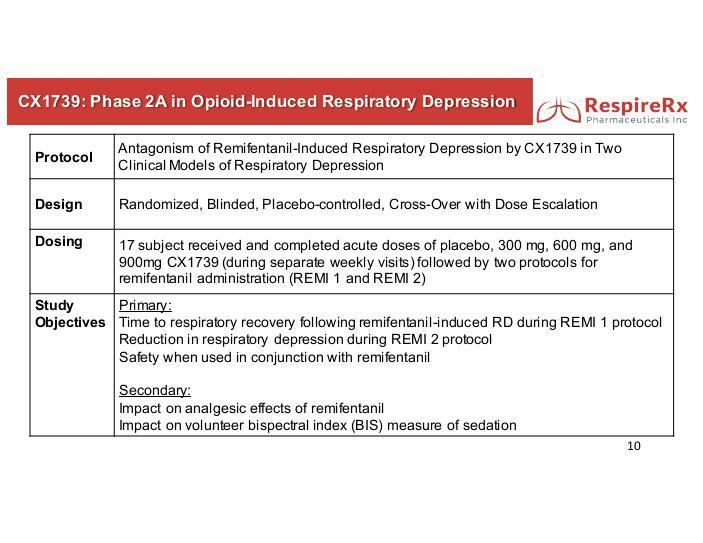 The data from 5 subjects was excluded from analysis because the REMI produced less than 25% depression of respiratory rate when these subjects were pretreated with placebo. 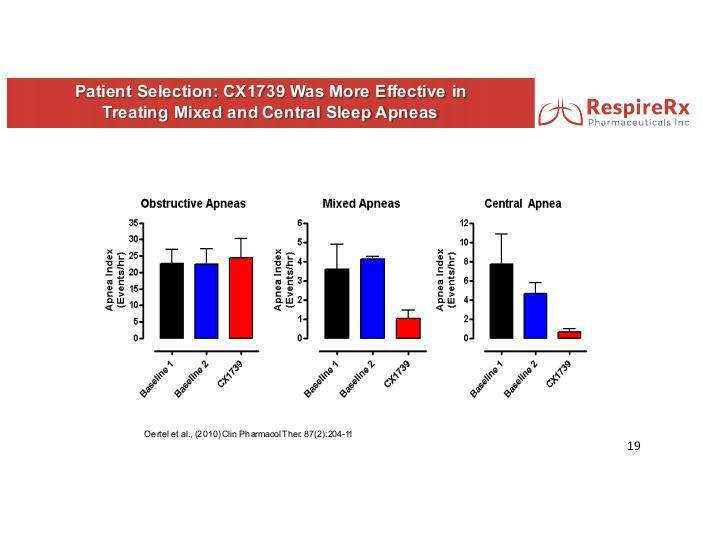 CX1739 produced a dose-related diminution in the respiratory depression produced by REMI, with statistically significant differences from placebo observed at 600 mg (p < 0.05, t test) and 900 mg (p = 0.01, t test). Data regarding CX1739’s ability to alter the opioid’s analgesic properties have not yet been analyzed. A full statistical analysis is expected to be completed during October 2016 and a clinical study report is expected to be completed by the end of December 2016. 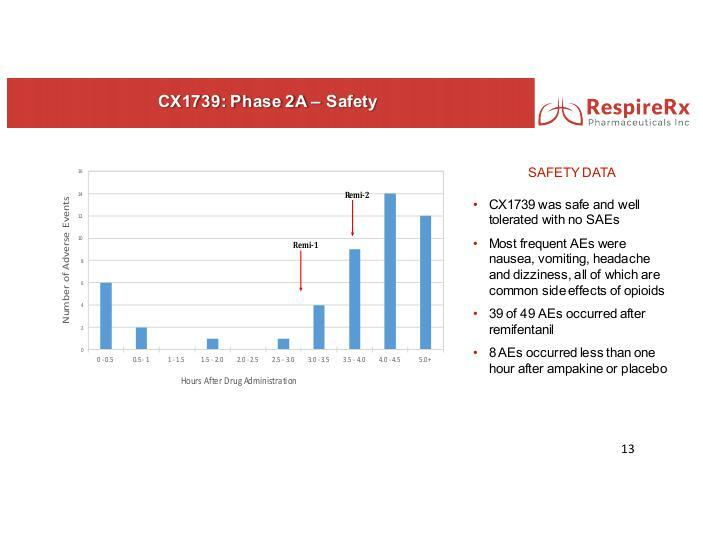 Having demonstrated proof of principle and target engagement, the Company has concluded that further development of CX1739 to determine its potential efficacy in the appropriate clinical indications is warranted, and future studies are being designed and planned. 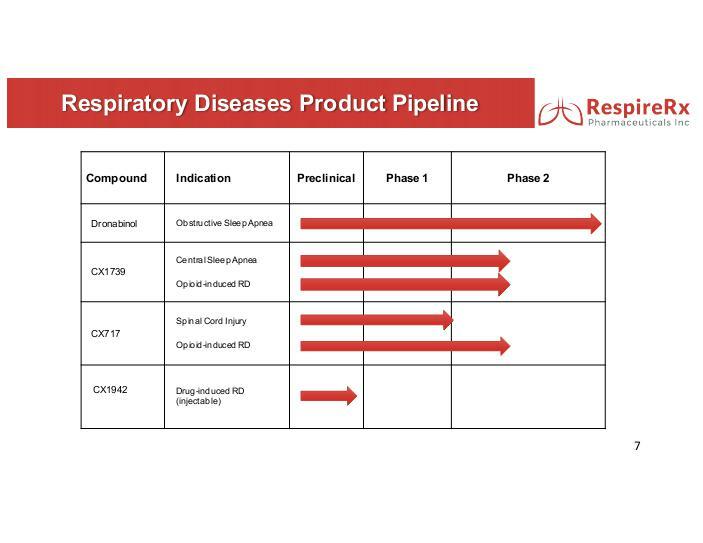 RespireRx has a pipeline of medicines in Phase 2 clinical development focused on pharmaceutical treatments for a variety of different breathing disorders. Clinical development in the area of respiratory disorders, particularly drug- induced respiratory depression and sleep apnea, has created opportunities for the development and commercialization of the Company’s compounds. Ampakines. 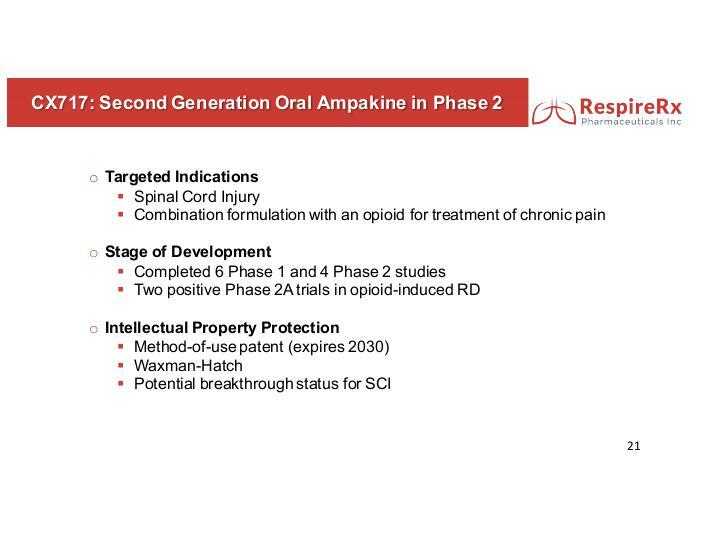 One platform being developed by RespireRx is a class of proprietary compounds known as ampakines, which act to enhance the actions of the excitatory neurotransmitter glutamate at AMPA glutamate receptors. 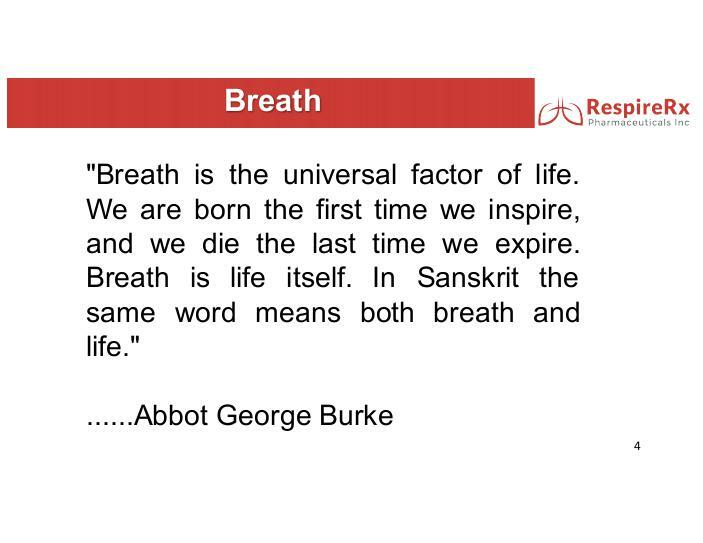 Several ampakines, in both oral and injectable form, are being developed by the Company for the treatment of a variety of breathing disorders. 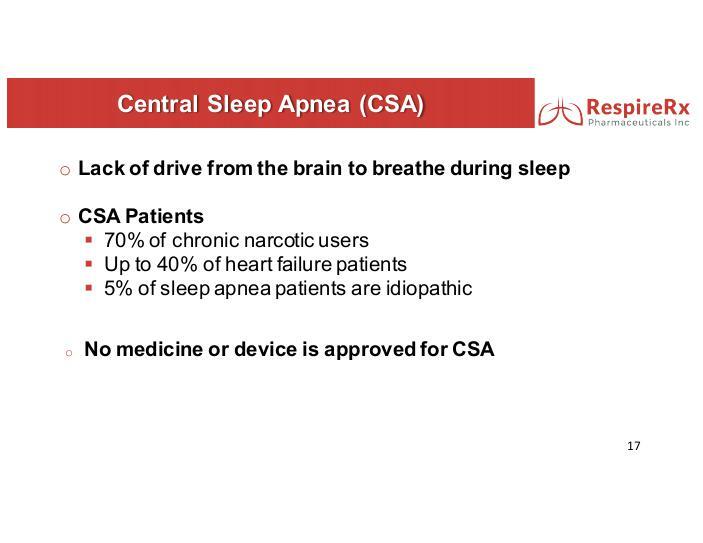 In clinical studies, select ampakines have shown preliminary efficacy in central sleep apnea and in the control of respiratory depression produced by opioids, without altering the opioid analgesic effects. In animal models of orphan disorders, such as Pompe Disease, spinal cord damage and perinatal respiratory distress, it has been demonstrated that certain ampakines improve breathing function. The Company’s compounds belong to a new class that does not display the undesirable side effects previously reported for other ampakines. Cannabinoids. A second platform being developed by RespireRx is the class of compounds known as cannabinoids, including, in particular, dronabinol, a synthetic version of ∆9-THC (∆9-tetrahydrocannabinol). Under a license agreement with the University of Illinois, the Company has rights to patents claiming the use of cannabinoids for the treatment of sleep-related breathing disorders. 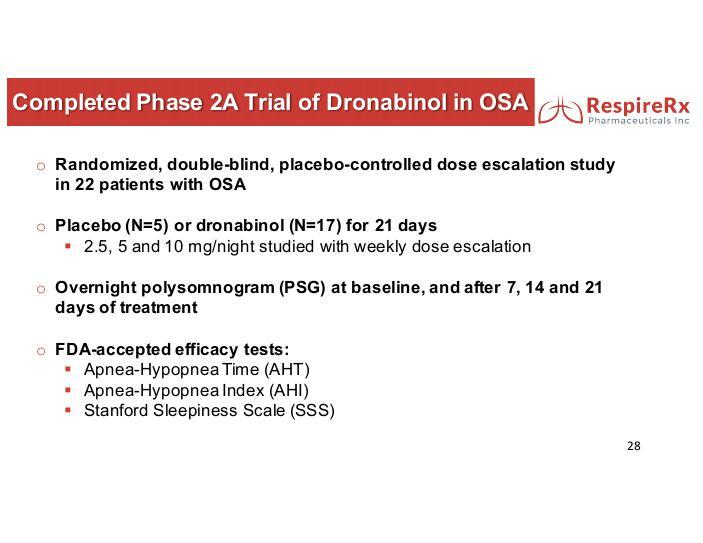 In a double -blind, placebo-controlled, dose-ascending Phase 2A clinical study conducted by the Company, dronabinol produced a statistically significant reduction in the Apnea-Hypopnea Index, the primary therapeutic end- point, and was observed to be safe and well-tolerated in a group of patients with Obstructive Sleep Apnea (“OSA”). 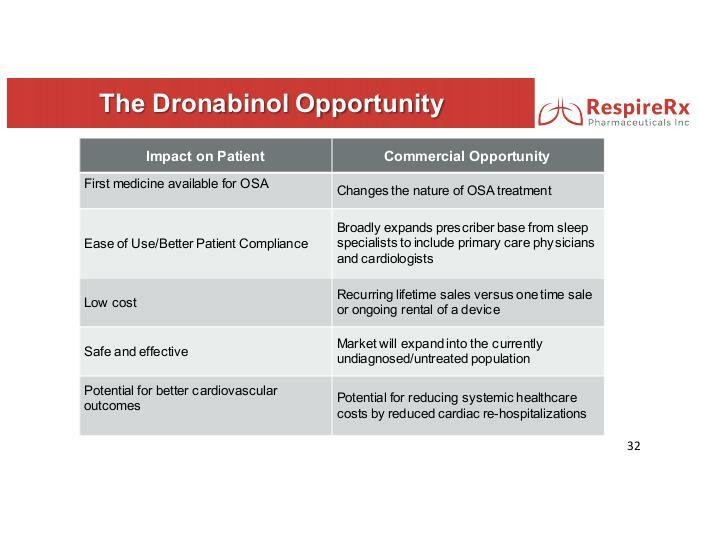 The University of Illinois and three other centers conducted a six week, double-blind, placebo- controlled Phase 2B clinical trial investigating the effects of dronabinol in patients with OSA. The University of Illinois has indicated that recruitment for this clinical trial was completed during the second quarter of 2016. Final research results are expected to be announced in the fourth quarter of 2016. 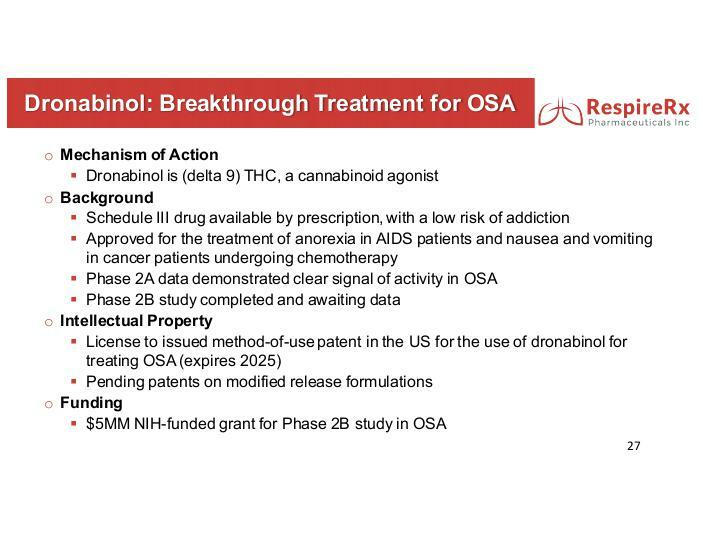 This clinical trial was fully funded by the National Heart, Lung and Blood Institute of the National Institutes of Health and was managed by researchers at the University of Illinios. This press release contains certain forward-looking statements within the meaning of Section 27A of the Securities Act of 1933 and Section 21E of the Securities Exchange Act of 1934 and the Company intends that such forward-looking statements be subject to the safe harbor created thereby. These might include statements regarding the Company’s financial position, business strategy and other plans and objectives for future operations, and assumptions and predictions about research and development efforts, including, but not limited to, preclinical and clinical research design, execution, timing, costs and results, future product demand, supply, manufacturing, costs, marketing and pricing factors, which are all considered forward-looking statements. The forward-looking statements included herein are based on current expectations that involve a number of risks and uncertainties. These forward-looking statements are based on assumptions regarding the Company’s business and technology, which involve judgments by management with respect to, among other things, future scientific, economic and competitive conditions, and future business decisions, all of which are difficult or impossible to predict accurately and many of which are beyond the Company’s control. 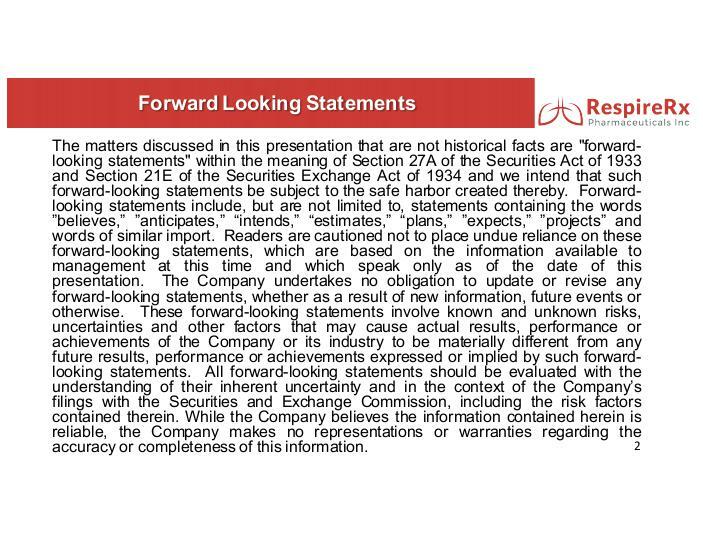 Although the Company believes that the assumptions underlying the forward-looking statements are reasonable, actual results may differ materially from those set forth in the forward-looking statements. In light of the significant uncertainties inherent in the forward- looking information included herein, the inclusion of such information should not be regarded as a representation by the Company or any other person that the Company’s objectives or plans will be achieved. Factors that could cause or contribute to such differences include, but are not limited to, regulatory policies or changes thereto, available cash, research and development results, competition from other similar businesses, and market and general economic factors. This press release should be read in conjunction with the condensed consolidated financial statements (unaudited) and notes thereto included in Item 1 of the Company’s most recently filed Quarterly Report on Form 10-Q and the Company’s Annual Report on Form 10- K for the fiscal year ended December 31, 2015, including the section entitled “Item 1A. Risk Factors.” The Company does not intend to update or revise any forward-looking statements to reflect new information, future events or otherwise.